Are you ready to wean? It’s all about to get messy! Who knew a baby with a little bowl of food could cause so much destruction? Weaning is a big step, a real milestone. It can be an exciting stage, and an anxious one requiring a bit of time and patience. Some mums feel sad that the introduction of solids signals the end of the teeny tiny baby stage. 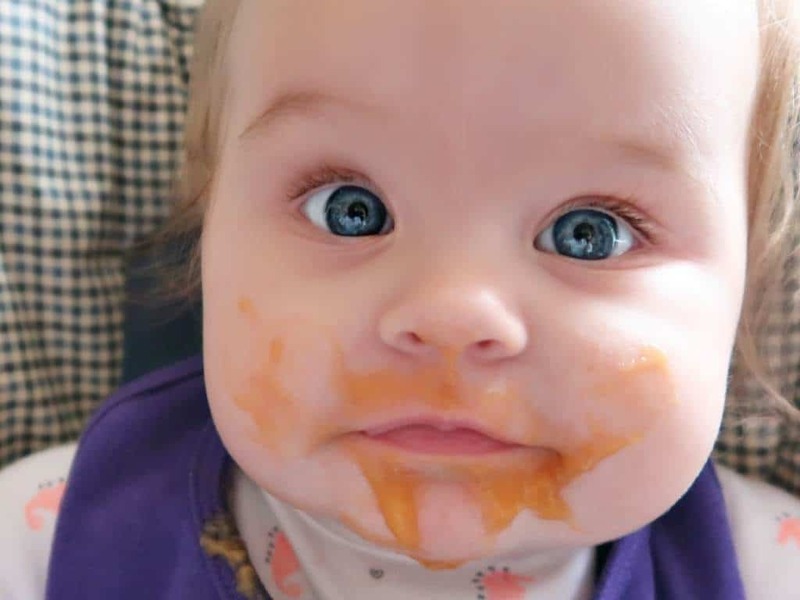 Whether it’s conventional weaning or baby-led sometime between 4 and 6 months of age (prior to 17 weeks babies digestive systems are not mature enough), you’ll see the signs (i.e. ability to sit up unaided) that it’s time to try some real food. Official advice from the Department of Health is to wait until your baby is six months old. HiPP champion’s safe feeding but also babies and their individuality. The cheeky, the chatterboxes, the fidgets, the fussy eaters! They encourage parents to have confidence in yourselves and your children. If you are going down the BL route then you will want to check out these baby led weaning essentials. Don’t feel nervous, feel confident. Of course, talk and share tips with other parents but do things your way and try not to worry how and what others are doing. Weaning is not a race or competition. Every baby is different so, relax go at their pace. Swallowing and chewing are skills that need to be learned. Follow your instincts, your babies’ natural leads. Enjoy it together. HiPP want you to ‘Feel HiPP’ on your weaning journey; enjoying and embracing every moment you share together to the fullest! Tip: We have found that a baby who is not ready will push their food back out with their tongue (tongue thrust reflex). Begin weaning at home, somewhere familiar where there are not too many distractions. When offering your baby, her very first taste or two reassure her so that she feels loved and secure. Ensure that your baby is supported in an upright position in their highchair. Give lots of smiles and gentle encouragement, if you’re happy, your baby’s happy! DO try rejected foods again later. It can take 8-10 tries for your baby to like a new flavour BUT don’t force your baby to eat. It will make her associate mealtimes with stress and anxiety, rather than discovery. Prepare for fantastic faces, messy clothes, splatters all over the floor and food in your hair! Encourage messiness. First experiences are about experimentation, touch and smell as much as taste. Playing with food is important, if your baby is squashing their banana into pulp and then eating it, this is a good thing. Don’t hover like a hawk and wipe everything clean within 2.5 seconds. For all of two weeks with my firstborn I was a baby food snob. Everything was diligently and reverently homemade. It’s easy with first tastes to boil up and blend some carrots, then stick them in ice cube tray (always batch freeze) and voila baby food. We encourage parents to don an apron and get cooking and pureeing! Prepare for babies to potentially only eat a tablespoon or two to begin with and don’t get disheartened if they spit it back out of you. A little research and experimenting with brands mean second time around I am much more confident to buy baby food. Choosing the HiPP way, Norah loves their healthy, organic foods. HiPP organic think dodging pesky chemically synthesised pesticides is a good thing for your baby, the planet and the taste of the food. Its gentler on tiny tums too. Using only delicious produce and exceeding EU Organic standards, they believe babies deserve food that tastes great to make them feel Hipp inside and out. HiPP believes Green is good, and so do we! I find resealable Jars so convenient when out and about. Pop one into your changing bag and off you go. All you need is a spoon, no need for a bowl. The jars are also reusable and recyclable. How much, how often and when??! Begin by offering food at a time that suits you both. Start with one meal and see how your baby does. We can’t say that the correct portion size for babies is a handful of this or 10 teaspoons of that as every baby is different. Breast or formula milk is still your babies’ main source of nutrition, so you can afford to take things slowly. When babies are starting to wean they will show a lot of variation week on week as to how much they are eating. So how do you know they are getting enough food? After two weeks/a month take out that little red book and get baby weighed as this is a good indicator if baby is getting enough nutrients to grow. By seven months, babies should ideally be having 3 solid meals a day. It is all about nurturing a healthy relationship with food. Begin by offering a few spoonful’s each day and introducing one new food at a time. Then you can mix it up. It’s all about different tastes not quantity. Traditionally, iron-fortified baby cereals with breast milk or formula are given first. Your baby’s first foods should be easy to digest and free from common allergens, just in case. Follow this with vegetables (steamed roots, like carrot and parsnip are favourites and going veg first helps lay the foundations for healthy eating habits). We love sweet potato, it is naturally sweet and make s a lovely smooth puree. Next comes the good first fruits including ripe, mashed banana, avocado and cooked apple or pear. Later comes meats. We have a very keen eater, if your baby is more reluctant then repeat a day. So, you could be doing day 1 for 2/3 days. Remember all of these are IF HUNGRY. Day 1. One meal a day and one main flavour. 2/3 tsp. Lunchtime or teatime to start. Baby porridge. Day 2. Pick a root vegetable. Pureed Sweet Potato and steamed Carrot stick to gum on. Day 3. Hipp Pear and Peach Breakfast with baby rice. Day 4. Steamed whole Broccoli floret to gum on. Pureed Cauliflower. Day 5. Hipp Pure Parsnip. Day 7. Multiple flavour combinations. 2/7 tsp. And two meals a day if baby is eating well. Breakfast. Baby porridge and pureed Prunes. Lunch/Dinner. Mashed up Potato and Squash with baby milk (new texture). Day 8. Breakfast. Mashed Banana. Lunch. HiPP Organic Buttered Vegetables. Day 9. Breakfast. HiPP Apple, Banana and Strawberry pouch. Lunch. Pureed Parsnip and Courgette. Day 10. Breakfast. Baby Porridge and pureed Apple. Why not bake some Apple slices to munch on? Lunch. HiPP Tasty Vegetable Risotto. Day 11. Breakfast. HiPP Peach and Pear. Lunch. Roughly blended Carrot and pieces of Pasta off mummy’s plate to munch on! Day 12. Breakfast HiPP pouch Apple, Banana and Strawberry. Lunch. Steamed whole Broccoli floret to gum on. Sweet potato and carrot puree. Day 13. Breakfast. Banana Yoghurt. Lunch. HiPP Mediterranean Vegetables. Day 14. Breakfast HiPP pouch Pear, Plum and Blackcurrant. Lunch. Pureed Avocado and Pear Puree. You can offer cooled boiled water in-between feeds but don’t panic if most of it gets dribbled out! Tip: Our menu includes soft finger and mashed foods as we are combining baby led and traditional. Just remember gagging and choking are two very different things! Are you going to be weaning soon or when you weaned your baby what were their favourite foods? Note: HiPP kindly sent us these yummy products to include within this feature#AD.